An action packed final 30 minutes saw Hassocks and Lingfield net five times between them with the Robins doing just about enough to run out 3-2 winners for their first league victory in over two months. Phil Johnson scored twice for Hassocks with substitute Jake Lindsey the other man on target, netting what proved to be the winner in the 90th minute. That put Hassocks 3-1 ahead, but there was still time for Jake Horn to pull one back with virtually the last kick of the game, leaving a nervy final few seconds which the Robins managed to see out. SEE ALSO Haywards Heath v Phoenix Sports - match report and picture slideshow | Burgess Hill Town salute 'role model' Pat Harding as he makes 350th appearance for the club | Burgess Hill Town's new head coach has changed the formation - but what other changes can we expect? It was breathless, tense, exciting and ultimately a massive three point for the Robins against a side they'd lost 3-0 to just a month ago in the Peter Bentley League Cup with the result taking them above Arundel and out of the relegation zone. Having not won in the league since bottom club Eastbourne United visited the Beacon on September 22nd, Mark Dalgleish looked to shake things up and he was aided in that by the return of two favourites. Bradley Tighe has rejoined the Robins from Lancing having left the Beacon for Ringmer originally in the summer of 2017. The former youth team products inclusion allowed Harvey Blake to move forward from right back to a more advanced wide role and the link up between the two down the flank pointed to a potentially promising partnership going forward. James Westlake was also back in the side for his first competitive action since December. Westlake has spent the past 11 months concentrating on his running commitments, in which time he was the seventh British finisher in the London Marathon, set a new course record for the Worthing 10k winning in 00:30:31, won the Brighton 10 mile and finished 20th in the Toronto Marathon on his debut for England athletics with a PB of 2:23:05. Not that you could tell that Westlake hasn't kicked a ball for nearly a year. Alongside Spencer Slaughter and the outstanding Harvey Enticknap, the Robins midfield three gave a hard working and organised showing which provided the platform for victory. Johnson was keen to praise the impact of Tighe and Westlake afterwards, saying, "The new boys that played were really good and made a real difference for us." "We showed great character throughout the game, especially to recover from the first equaliser and then go and win the game. It's an important win to get under our belts as we've been on a bad run recently." There was little of note to report in the opening exchanges. Hassocks did get themselves into a bit of a pickle when attempting to play out from the back, Spencer Slaughter's back pass to Josh Green being returned by the Hassocks goalkeeper into a gap between Jordan Badger and Dan Jacques which nearly proved costly not just in terms of goal but in terms of discipline as Slaughter and Harry Mills shared more than a few stern words before being separated by Badger. Slaughter put that down to the two individuals passion for the club afterwards and Hassocks certainly channeled any frustrations they had positively in the second half, Johnson continuing his remarkable record of missing with his head when nodding a corner wide when left free in the box. The Robins top scorer made up for that miss by earning and then converting a penalty for the opener on the hour mark. Tighe hit a brilliant long ball over the top and Johnson's pace took him steaming past Jamie Bakhit whose only answer was to haul the Hassocks striker down. Bakhit received a yellow for his troubles and Johnson made no mistake from the spot, sending goalkeeper Oliver Moore the wrong way to give Hassocks the lead. 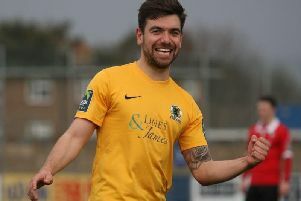 17 minutes elapsed before Lingfield equalised on 77 and they were level for all of five minutes before an error from Moore gifted Johnson his second, the Lingers number one spilling a shot straight to Lindsey who sensibly squared to Johnson for a tap in. Johnson's pace again caused devastation in the visitors back line with a couple of minutes remaining and he ran through before whipping the ball in for Lindsey to tap home at the back post to make it 3-1 but the game wasn't done yet, Jake Horn scoring the Lingers second with seconds remaining. Having not won for so long, the Hassocks faithful could've been forgiven for feeling anxious in what remained but there was no time for Lingfield to force an equaliser as the Robins hung on to three precious points which moves them out of the bottom three. Hassocks: Green; Tighe, Jacques, Mills, Badger; Enticknap, Slaughter, Westlake; Wilkins, Johnson, Blake. Subs: Lindsey, Bull, Spinks (used).